Hope you are enjoying your Sunday, morning spent doing some chores and more laundry, walk over the dunes too, lovely day with intervals of sunshine but still a wee nip in the easterly breeze. Dave the boiler man will be popping over tomorrow afternoon to inspect the boiler again, so hopefully we will have heating on again.... another arm and a leg.! Off to get lunch and then another walk over the dunes later, lots of folk about this weekend here in rented cottages so more cars about . Beautiful day here. Blue sky and sunshine. Children and grandchildren over. Theo busy practising his Grade One piano piece (or one of them). Made a Lemon Drizzle cake with Beanie - or rather we made some lemon drizzle and poured it over an old an partially dried up sponge cake which hadn't been eaten. The result after having been baked in the oven was excellent. Also played a game called 'Deep Sea Adventure' which comes in a box no bigger than a box of cooks' matches. Brilliant game all about divers bringing up treasure from the deep but all the players have a collective but limited supply of oxygen. The deeper you dive the more treasure you can collect but you may not make it back to the surface. A game both of chance but also tactics. Now I am exhausted as is usually the case when I have been around the energy zappers. I am quite collapsed. 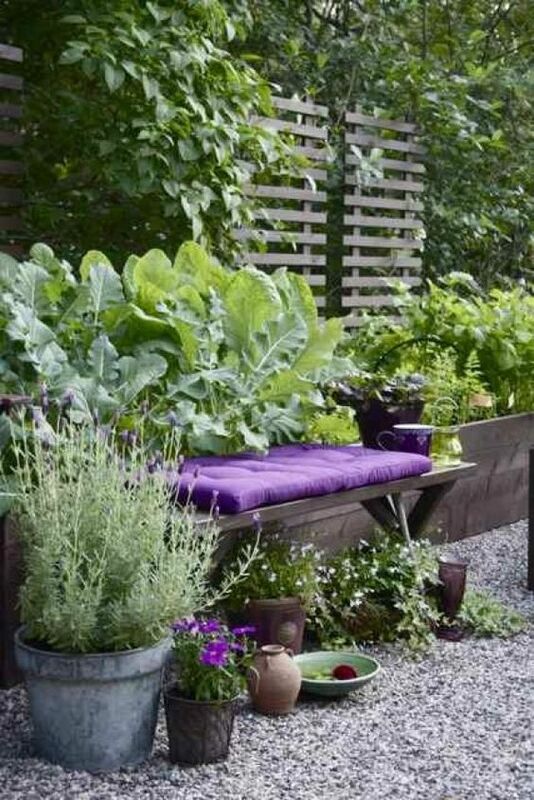 What are those brassicas, Camilla, lurking by the purple seat? Horrendous sleet and ferocious gusts of wind here today. HO was doing a secret photo shoot on the beach for a supporter who was proposing (she said yes) they managed to squeeze it in between squalls. I was luckier being inside all day at a harp workshop then our spring concert. A bit on the chilly side as the church heating is broken too!